The past few days we have been hanging out with Finley (or Stileet his stage name). After we caught all those conchs the other day he went out with the boys and caught another 15 or so. 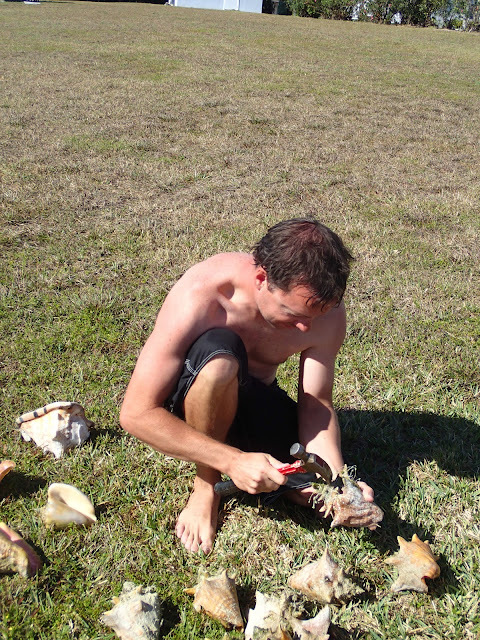 We ended up with around 34 conchs. He had said if I'm going to crack conch we are going to do a lot because it takes so much time. He wasn't kidding from start to finish on cracking to eating it took 4-5 hours. We had no shade so we improvised and made our own shade. The "pistol" of the conch is supposed to make your back strong. It looks and taste like a saltwater gummy bear. Stileet ate about 20 and Dan and Preston ate 2 each and I tried one. Conch salad is on every menu here and is definitely considered a bahamian dish. It is basically conch, onion, green pepper, tomato, goat pepper (habenero), salt, and lime juice. It was very fresh and the combination was delicious. Conch is a muscle and so it is quite tough, but we couldn't taste any conch just the texture. All in all we had a great time talking while making the salad. That looks delicious. So what part of the conch is the "pistol", exactly? Is it what I think it is? Im glad we got to "see" you last night ;) we'll need to facetime you guys again. Finally some American food, wieners and salad. I good luck to Wilson and Herbie on their fishing adventure today.